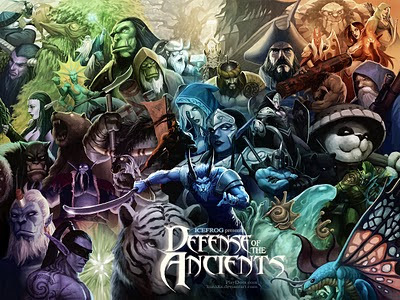 Check out the above picture for the new DotA 6.69 Loading Screen! On this version, Kunkka decided to try a new style to draw all the Sentinel heroes for the loadscreen. What do you think? Share it here or you could also directly email your feedback to Kunkka at kendrick@imaginaryfs.com. Enjoy! PS: Click the image for the full resolution of the new loadscreen. hey...captain hook(admiral) is there....nice face...!!! Anyone realise all the heroes are from the Sentinel and Neutral taverns? None from the Scourge. If you look and count carefully, you will recognize all 35 Sentinel heroes, there are NO neutral and NO Scourge heroes, i.e. also no Tinker. The 6.67 one is better.. This one is kinda flat but I couldn't have done it better. Thanks Admiral Kendrick! i like antimage... see,, really cool dude!!!!! wherEs the one riding at mirana!? ?